This is the cheapest way to satisfy a need for speed and European car fetish in one go. When looking at modern cars, it was the 1.4-liter turbocharged Fiat 500 Abarth that came out and taught the world that small displacement four-bangers could sound like eight-cylinder Ferraris. This was fantastic news because turbochargers and downsized engines were starting to become the norm, and now it was known that the change would not have to come at the expense of a rich exhaust note. Furthering the credibility of a small engine opera is the Audi TT RS, which shares a 2.5-liter turbocharged engine with the new RS3 sedan. It makes the same 400 horsepower as the sedan and best of all, shouts a fantastic song despite not being a burly Pavarotti-sized motor. It’s secret? Well, let’s start with the fact that its 2.5-liters are spread out over five pots, each with 0.5-liters of space. This makes the engine odd, literally and figuratively. With four, six, or eight cylinder vehicles, there is at least one cylinder that can help cancel out the explosive motion of the adjacent pistons, but that isn’t the case with an inline-five engine. 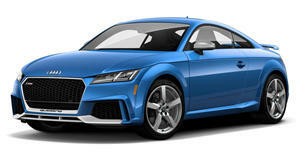 The result is that the Audi TT RS maintains a raspy metallic exhaust note with a computer controlled snaps and crackles delivered with every upshift or downshift. Once transitioning from country road back into city, a simple removal of lead from shoe keeps things hushed, making the TT a perfect companion for the daily driver who needs their weekend thrills and doesn’t mind that the TT isn’t as cool as a Porsche 911.